Melbourne [Australia], Apr 3 (ANI): Former England captain Sir Alastair Cook has cleared the air about his comeback in the Ashes this year declaring that he has played his last game for England. Dubai [UAE], Sep 12 (ANI): England opener Alastair Cook ended his international career on a high note as he finished off by breaking into top ten of the International Cricket Council (ICC) Test player ranking. London [United Kingdom], Sep 12 (ANI): India went down in the fifth and final Test against England by 118 runs at the Oval on Tuesday. 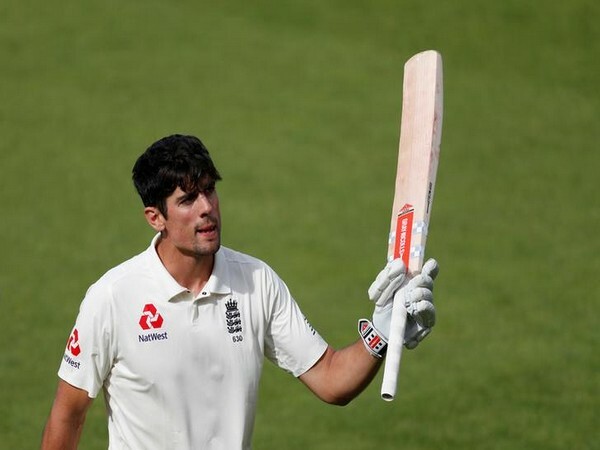 London [UK], Sep 10 (ANI): Former England skipper Alastair Cook on Monday became the most successful left-hand batsman in Test cricket as he surpassed former Sri Lankan captain Kumar Sangakkara's figure of 12400 runs in the longest format of the game. London [UK], Sep 08 (ANI): England were on Friday restricted to 198 runs for the loss of seven wickets at stumps, Day 1, in the ongoing fifth and final Test match against India at the Oval cricket ground here. London [UK], Sep 7 (ANI): India will look to end their two-month long tour to England on a high note while taking on the host side in the last Test of the ongoing five-match series at the Oval Cricket Ground on Friday. London [UK], Sep 5 (ANI): Indian head coach Ravi Shastri has said that the team have competed hard in the ongoing five-match Test series against England, but it is high time that they start completing the games. Karachi [Pakistan], Sep 5 (ANI): Trinidadian cricket commentator and journalist Fazeer Mohammed believes that the Indian side relies heavily on their captain Virat Kohli. London [UK], Sep 4 (ANI): England have retained left-hand batsman Keaton Jennings in their 13-member squad for the final Test of the ongoing five-match series against India, beginning September 7 at the Oval.